Latin America is a multicultural and multilingual region, of which Costa Rica does not escape; hence addressing issues of policy and language planning is fundamental, particularly if we consider that the traditional view tends to hide other cultures and languages that make up the identity of a country. Given the above, it is crucial to have a space in which it is possible to share experiences, where the problems, both national and international, that are exposed, allow us to analyze the situation and postulate solutions from the point of view of the diversity. The area of linguistic policy and language planning is an interdisciplinary field of research in growth. There is increasing awareness of the importance of language policy and language planning in education, public service administration and in economic circles. Language policy can influence student outcomes in the labor market, citizen participation in democratic decision-making processes and the ability of companies to compete. Therefore, it is a field of study that requires contributions from various specialties. 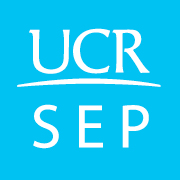 Although linguistic planning has traditionally been part of sociolinguistics, it now tends to become an interdisciplinary area in which specialists from sociolinguistics, political science, economics and philosophy converge; therefore we propose an international Summer School on this subject, which would be the first one to be held in Latin America. 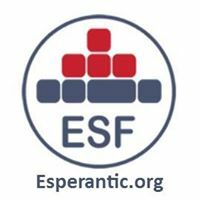 The Institute of Linguistic Research (INIL) of the University of Costa Rica, in collaboration with the Esperantic Studies Foundation (ESF) (http://www.esperantic.org/en/home/), invites to the Summer School on Linguistic Policy, Linguistic Planning and Evaluation (PLPLE), which aims to open an international space for discussion on Linguistic Policy and Linguistic Planning. The Summer School will consist of the description and analysis of the fundamental concepts of Linguistic Policy, Linguistic Planning and Linguistic Policy Evaluation, as well as its objectives and methods. During the four sessions of the Summer School, the exponents will refer to specific cases that they have investigated. Of the four sessions, three of them will be held in English and one in Spanish. At the same time, there will be a series of lectures related to the Summer School topics. The Summer School will last a week, with 20 hours, in a total of 4 days (except on August the 2nd, which is a holiday). The Summer School aims to attract postgraduate students from several countries and to offer them state-of-the-art training to study the theoretical, methodological and practical foundations of Linguistic Policy, Linguistic Planning and Linguistic Policy Evaluation. It will also be a space for meeting, communication, collaboration and exchange of ideas between researchers working in linguistic policy, language planning and evaluation. Analyzing and discuss the national and international linguistic situation from the point of view of Linguistic Justice and Linguistic Planning. Explaining the proposed solutions to situations of injustice and linguistic imbalance, at both national and international level. Preparing the professionals to understand the requirements of multilingual societies, with special emphasis on Costa Rican situation. Systematizing, for dissemination purposes, the analysis and discussion of activities in favor of the strengthening of linguistic rights. Improving the effectiveness and the efficiency of language policies. Dr. David Cassels Jonhson (https://education.uiowa.edu/person/david-cassels-johnson), University of Iowa, US. Associate Professor of LPP, publisher of the book Research Methods in Language Policy and Planning: A Practical Guide, with Hult, F., 2015: Malden, MA: Wiley-Blackwell, and author of Language Policy, 2013, Basingstoke, UK: Palgrave Macmillan . Dr. Michele Gazzola (www.michelegazzola.com), Humboldt-Universität zu Berlin (Germany), University of Lugano (Switzerland), and Institute for Ethnic Studies in Ljubljana (Slovenia), researcher on language economics and language policy evaluation. Editor of the book The Economics of Language Policy, with B.-A. Wickström, 2016, Cambridge (MA): MIT Press, and author of The Evaluation of Language Regimes, 2014, Amsterdam: John Benjamins. Dr. Federico Gobbo (http://federicogobbo.name), University of Amsterdam, Netherlands and University of Turin, Italy. Professor of Interlinguistics and Esperantology, author of the book Constructive Adpositional Grammars: Foundations of Constructive Linguistics, 2011, Cambridge: Cambridge Scholars Publishing, and the article “Are planned languages less complex than natural languages?” In Language Sciences, 2016. Dr. Carlos Sánchez Avendaño (http://filologia.ucr.ac.cr/sites/default/files/cvs/lin15.pdf), University of Costa Rica. Full professor of Linguistics and specialist in Linguistic Revitalization. Author of the book La cola de la iguana: El pueblo Malecu ante el desplazamiento de su lengua y su cultura tradicional, 2015, Costa Rica: Editorial Universidad de Costa Rica, and the article “Reconstitución léxica y variabilidad morfoléxica de una lengua muy desplazada: El caso del vocabulario del cuerpo humano en la lengua de brorán (térraba)”, in Estudios de Lingüística Chibcha, 2015. The working languages will be English and Spanish. The proceedings will appear in the magazine Káñina, Revista de Artes y Letras de la Universidad de Costa Rica (http://revistas.ucr.ac.cr/index.php/kanina). Dra. Marielos Murillo Rojas (Universidad de Costa Rica): “Linguistic Planning in Basic General Education”. M.L. Christian Ramírez Valerio (Instituto Nacional de Aprendizaje): “Linguistic Planning in Costa Rican Sign Language”. This Summer School is registered in the University of Costa Rica in the Vicerrectoría de Investigación, code 745-B7727 and in the Vicerrectoría de Acción Social, code ED-3256, and it has the support of the Institute of Linguistic Research (INIL), the Vicerrectoría de Investigación (http://www.vinv.ucr.ac.cr/), the Posgrado de Lingüística (http://www.linguistica.ucr.ac.cr/), the Sistema de Estudios de Posgrado (SEP) (http://www.sep.ucr .ac.cr/) and the Esperantic Studies Foundation (ESF) (http://www.esperantic.org/en/home/). Participation or attendance, depending on each case*. Tuesday, June 6th, 2017, with limited capacity. 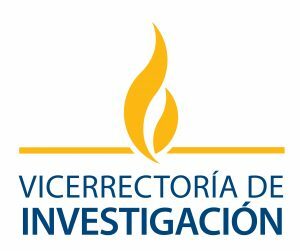 Students and functionaries of the University of Costa Rica do not pay the registration fee. *This registration fee is non-refundable. IMPORTANT NOTE: The registration process for foreign participants will begin on May 12th, 2017 on this website. Before this date, the participants can send an email expressing their interest in the activity and their possibilities on attending to it. The direct contact will be Yislén Barboza at yislen.barboza@ucr.ac.cr, for this purpose or for any other questions regarding the Seminar. There is the possibility of publishing the Proceedings of the Summer School on Linguistic Policy, Linguistic Planning and Evaluation (PLPLE) in the Revista Káñina, of the University of Costa Rica (http://revistas.ucr.ac.cr/index.php/kanina), so we invite all the participants of the Summer School to send their proposals. We will only receive academic articles from the thematic areas discussed above. These should be sent with a summary in Spanish and English of a maximum of 200 words. The accepted languages are Spanish, English, French and even other languages, depending on the availability of blind peers. Only twelve (12) articles will be published. Those who send their proposal for publication will receive an answer from within four weeks after it has been reviewed by the blind peers. 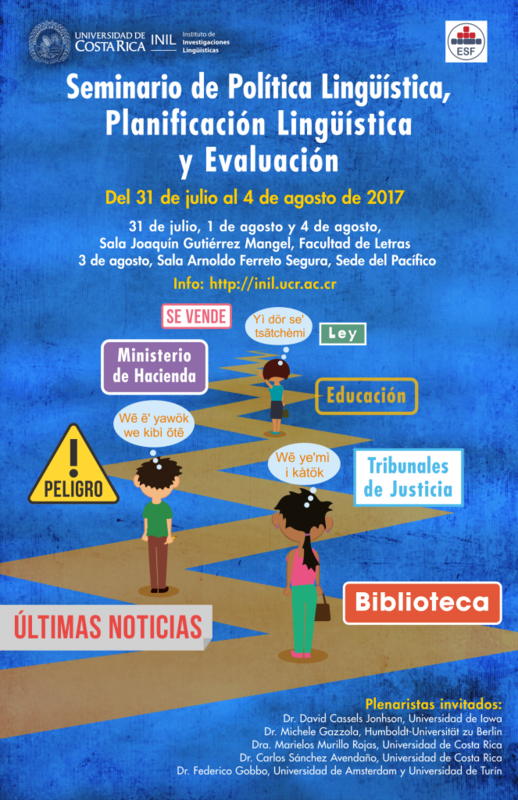 Interested parties will have up until June 6th, 2017 to send the proposals to linguistica.ucr@gmail.com. Conference: “Evaluation in Language Policy and Planning (LPP)”. Bus departure to Sede del Pacífico, Arnoldo Ferreto Segura. Faculty of Letters, Ciudad Universitaria Rodrigo Facio, University of Costa Rica. Conference: “Interlinguistics as extreme language planning: categories and cases”. Return departure to San José. Conference: “Problems of planning in languages ​​in process of displacement”. Talk: “Linguistic Planning in Basic General Education”. Talk: “Linguistic Planning in Costa Rican Sign Language”. In the lobby. Faculty of Letters, Ciudad Universitaria Rodrigo Facio, University of Costa Rica. Everyday from 11:00 a.m to 2:00 a.m. Address: In front of Rotonda de la Bandera, San Pedro de Montes de Oca, San José. Variety of restaurants and food court. 50m north of Law Faculty, University of Costa Rica. Barrio Dent, San Pedro Montes de Oca, 75 meters west of Taco Bell. 2 locations (“Ciudad de la Investigación” in Sabanilla y “Ciudad Universitaria Rodrigo Facio”: north side of UCR, in front of Medicine Faculty (School of Medicine), 150 meters west of Hotel D´Galah). 125 meters south of Spoon, Los Yoses. 75 meters west of Automercado in Los Yoses 75 metros, Central Ave, 35th and 37th street. 250 meters north of Grupo Q, Barrio Dent, Los Yoses.